With Halloween just around the corner, I am in a pumpkin frenzy. 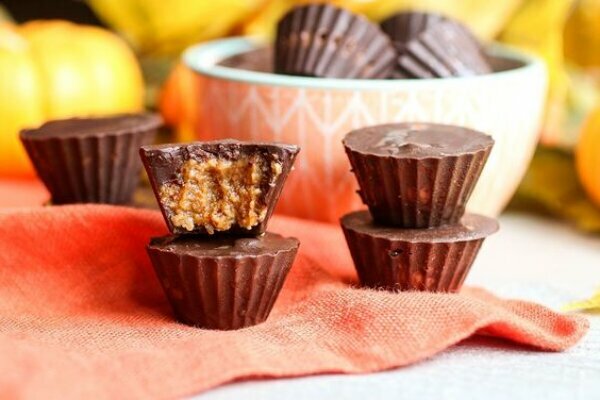 Pumpkin chia pudding and pumpkin smoothies just weren’t enough so I decided to turn it up a notch with these Chocolate Pumpkin Almond Butter Cups. 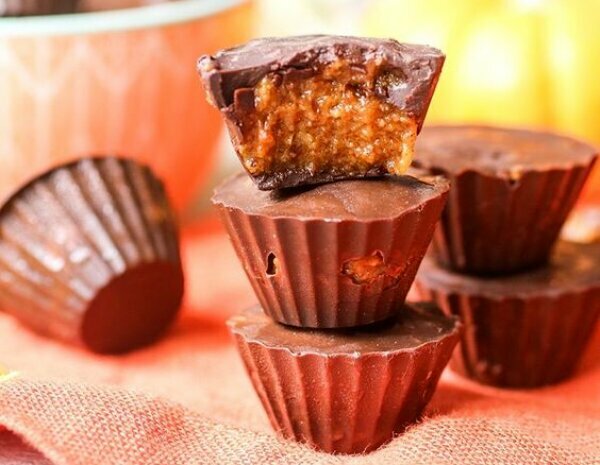 Reese’s peanut butter cups were by far my favorite kind of candy as a kid. I actually never had a huge sweet tooth but every Halloween I would sort through my candy stash and pick out all the Reese’s and eat those before anything else. 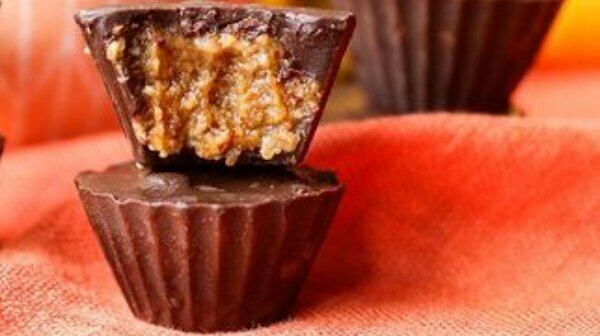 As much as I loved them through my childhood and teenage years, I haven’t had a Reese’s peanut butter cup in probably 5 or so years. In fact, I haven’t had peanut butter in nearly that long either. Peanuts, despite their name, are actually not nuts. They are legumes and are part of the same family as beans. As a general rule I do not include legumes in my diet for a number of reasons. After struggling with digestive issues for my entire life, cutting out grains, processed carbohydrates and legumes helped tremendously. Secondly, legumes contain lectins and phytic acid which are also referred to as anti-nutrients. Although the concept of an anti-nutrient might seem strange… these compounds actually bind to minerals such as zinc, magnesium, calcium and iron, preventing your body from absorbing them. In small doses or when eaten occasionally legumes won’t be detrimental to your health but when eaten regularly they can cause mineral deficiencies and digestive discomfort. Although I haven’t discussed it in depth other than in my post about stress, I have been suffering from hormonal acne for the past 5 years. Those of us with hormonal imbalances tend to be very low in the minerals mentioned above so I try my best to stay away from legumes as much as possible. Thankfully, my acne is finally dissipating so you can expect a lot more from me on how I’ve healed my skin in the near future! Anyway, back to what really matters. This ridiculously amazing recipe, of course. Almond butter (as long as it’s not full of added sugars or oils) is a great, healthy alternative to peanut butter. Personally, I love to purchase the almond butter that you can grind right there in the store. This way I know that all I’m getting is straight up ground almonds without any hidden, processed ingredients. In a medium sized mixing bowl, combine all filling ingredients and mix well. Set aside. Combine chocolate ingredients and melt chocolate using a double boiler. With a small spoon (about the size of a ½ teaspoon), carefully add a spoonful of chocolate to the bottom of a chocolate cup mold. 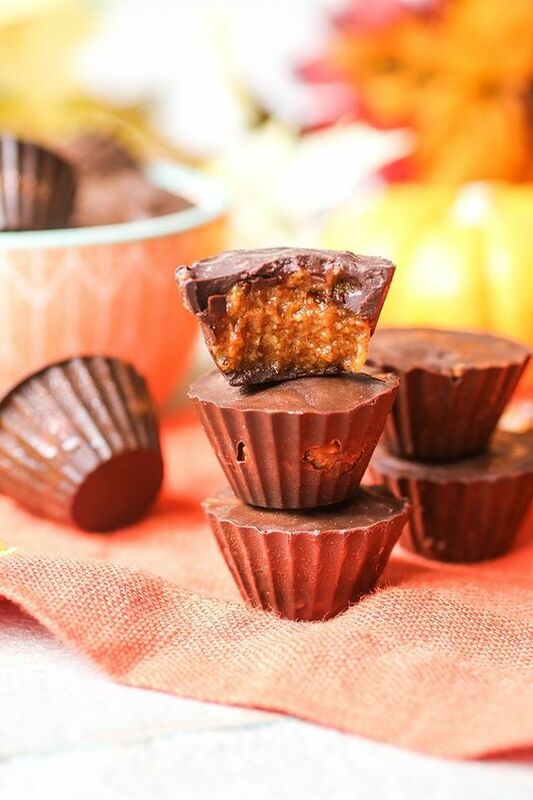 Using the back of the spoon, gently spread the chocolate on the bottom of each cup onto the sides of the cups. This way the chocolate won't just be on the bottom and top, but on the sides as well. Place mold in the freezer for a couple minutes to harden. With the same small spoon, add one scoop of the filling mixture on top of the initial chocolate layer. Once each cup has the filling added, go back to the chocolate and add enough in so that each cup is full. Make sure to fill all parts of the cup mold so that there aren't any air bubbles. 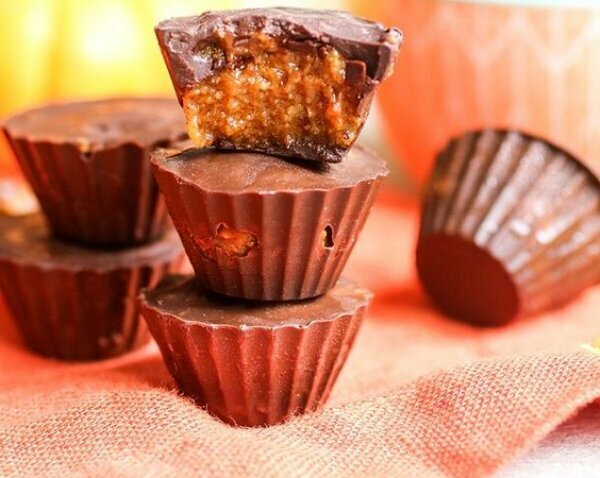 Freeze cups until hard and remove gently from the mold. So are these considered Paleo? Hi Juli, that depends on what your definition of paleo is. 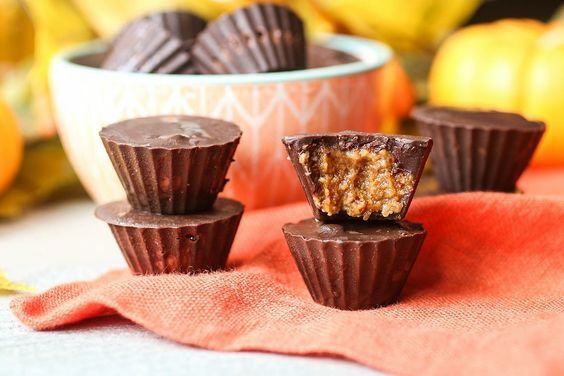 They are made with all paleo-friendly ingredients but like any treat, should be enjoyed in moderation!